The Eurasian wryneck (Jynx torquilla) belongs to the family of woodpeckers, piculets, wrynecks and sapsuckers, Picidae. The Eurasian wryneck species are distributed in Indian subcontinent, Europe, western, central and eastern Asia, central Africa and southeast Asia. These wryneck species are able to turn their heads almost 180 degrees and hence the name "wry-neck". These wrynecks are polytypic species. The Eurasian wryneck (Jynx torquilla) is a small long-tailed woodpecker, measuring 15 to 17 cm in length and weighing 30 to 50 grams. The Eurasian wryneck is small, slim and elongated, looking more like a thrush than a woodpecker. It can rotate its head up to 180 degrees and look virtually over the back. If startled, the Eurasian wryneck will shake and twist its flexible neck and raising its crest, will hiss like a snake. Hence, the name wry-neck. Sometimes when threatened it will close its eyes and go limp, playing dead. The plumage of the Eurasian wryneck is cryptically colored in shades of brown and gray. The upperparts are pale grayish brown with rufous and blackish bars and streaks. There are dark brown eye stripes starting from the rear edge of the eyes and extending to the neck. The rump and uppertail coverts are gray with brown speckles and stripes. The tail of the Eurasian wryneck is rounded. The tail is grayish, having brown speckles and faint grayish brown bands. The primaries and secondaries are brown with rufous and sandy brown bars and markings. The chin of Eurasian wryneck is whitish with brown barring. The throat, cheeks and upper breast are buff with brown barring. The underparts are creamy white with brown bars and spots. The flanks are buff with brown bars and spots. The undertail is buff with narrow brown bars. The bill of the Eurasian wryneck is shorter for a woodpecker. It is grayish brown, slender and pointed and has a broad base. The long, pink, sticky tongue wraps around the ant before being pulled out. The irises are brown and eyes have brown eye-ring. The feet are pale grayish brown. The digits are zygodactyl, two toes facing forward (digits 2 and 3) and two back (digits 1 and 4). zygodactyly helps in clinging to vertical surfaces. The call of the Eurasian wryneck is repeated harsh, shrill "quee..quee..quee" and "Kwieh..Kwieh..Kwieh" sound. An alarmed bird makes repeated "tuck..tuck..tuck" sound and also hisses like a snake. The Eurasian wryneck species are distributed in Europe, western, central and eastern Asia, southeast Asia, Indian subcontinent and Africa. In India, these Eurasian wryneck species are distributed in almost all the states. They do not occur south of Mysore, Cauvery delta and Puducherry. Breeding populations occur in Jammu and Kashmir, Himachal Pradesh, Punjab and Uttarakhand. The Eurasian wryneck nominate subspecies J. t. torquilla is distributed in most of Europe and western, central and eastern Asia. This subspecies winters in Iberian Peninsula, Africa, India and southeast Asia. The Eurasian wryneck subspecies J. t. tschusii is distributed in east Adriatic coast, Italy, Corsica and Sardinia. This subspecies winters in southern Italy and Africa. The Eurasian wryneck subspecies J. t. mauretanica is distributed in northwest Africa. The subspecies J. t. himalayana occurs in north Pakistan and northwest India. This wryneck subspecies winters southwards in lower altitudes. The Important Bird and Biodiversity Areas (IBA) of these Eurasian wryneck subspecies in Russia are, Bryansko-Zhizdrinskoye woodland, Racheyski forest and Zhigulevski Nature Reserve. The IBA in Ukraine are Gomol'shans'ka forest and Samars'kyj forest. The IBA of the Eurasian wrynecks in Switzerland are Simplon region, Mont Tendre, Maggia valley, Bregaglia valley, Central Valais between Sierre and Visp, Generoso mountain, Heinzenberg mountain and surrounding valleys, Jura mountains of Baselland and Swiss National Park. The IBA of the Eurasian wrynecks in Slovenia are Vipavski rob, River Mura, Kozjansko and Kočevsko. The IBA in Bulgaria are Western Balkan, Byala Reka, Strandzha and Sredna Gora. The IBA of wrynecks in France is Vallée du Régino. The IBA of the Eurasian wrynecks in Czech Republic are Pálava, Beskydy mountains, Confluence of the Morava and Dyje rivers, Lednicke rybniky ponds, Krivoklatsko, Krivoklatsko and Doupov hills. The IBA in Serbia is Deliblatska pescara. 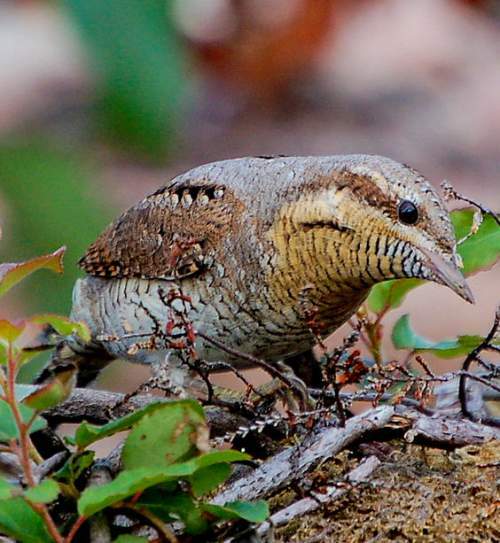 These Eurasian wryneck species have low forest dependence. These species normally occur in altitudes from 0 to 3300 meters. The artificial ecosystems of these Eurasian wrynecks include cultivated land, pastureland, plantations, rural gardens, orchards and urban parks. The natural ecosystems of these wryneck species include boreal forests, temperate forests, temperate grasslands, coastal marine lagoons, coastal freshwater lakes, Mediterranean-type shrublands, dry and moist shrublands. The diet of the Eurasian wryneck consists mainly of larvae and pupae of ants. Small beetles, aphids, dipteran flies, bugs, moths and spiders are their primary food. Compared to their size, these birds have a very long tongue. Unlike woodpeckers, these wryneck species do not peck holes in trees in search of food. They extend their long sticky tongues between cracks in wood and bark to probe and snap up ants and other insects. The Eurasian wrynecks also forage on the ground and ant-hills, moving around with short hops with the tail held in a raised position. They also catch flying insects on the wing. The breeding season of these Eurasian wryneck species is in May and June in most of their range. A second clutch may be laid in June-July, especially in southern breeding populations. In rare cases a third brood is raised. On return to the breeding grounds, the Eurasian wryneck species pair up for the season and set up territory. The territory is defended very aggressively. These birds display by perching facing each other with open bill and bobbing their heads up and down. The nesting sites of Eurasian wryneck include old orchards with several ant nests, old trees with cavities and pre-existing holes in the trunk, crevices in walls vacant burrows. Sometimes they evict a previous occupant, its eggs and nestlings from the nesting hole. The nest burrow is cleared of eggshells and other debris from the previous nesting. They do not use any nesting material and lining. The Eurasian wryneck clutch contains usually between seven and ten dull white, partially opaque eggs. The eggs are laid daily and after the last egg is laid, both the Eurasian wryneck parents incubate, the female brooding for longer periods. The chicks hatch out in about twelve days. The nestlings are fed by the parents. They fledge in about twenty days. The Eurasian wryneck species are highly migratory birds. The breeding populations of Eurasian wryneck occur in Europe and Asia. The breeding birds from Europe and western Asia migrate southwards, south of Sahara, for wintering in western, central and eastern Africa. The breeding populations of Eurasian wryneck from central and eastern Asia migrate southwards to Indian subcontinent, southeast Asia and Japan for wintering. They return to the breeding grounds in the early summer. Both in the spring migration of these wrynecks to their breeding grounds and in the autumn migration to wintering grounds, there are several stopovers for feeding. Perhaps, their short, rounded wings may a hinderance for long-haul flights. The global population size of the Eurasian wryneck (Jynx torquilla) is estimated to number 3,000,000 to 7,200,000 mature individual birds. The overall population trend of these species is reported to be decreasing. Throughout its range this wryneck species is reported to be common to uncommon. The generation length is 3.5 years. Its distribution size is about 38,400,000 sq.km. Habitat degradation, climate change, agricultural expansion and decrease in ant populations due to pesticide use are the main threats that may endanger the survival of these wryneck species. The Eurasian wryneck (Jynx torquilla) does not approach the thresholds for being Vulnerable, either under the range size criterion, or under the population trend criterion or under the population size criterion. 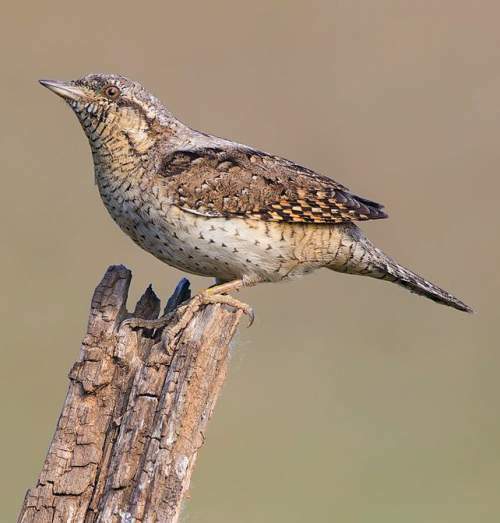 The IUCN (International Union for Conservation of Nature) has categorized and evaluated the wryneck species and has listed it as of "Least Concern". The CITES (Convention on International Trade in Endangered Species of Wild Fauna and Flora) status is ‘Not Evaluated’ for Eurasian wryneck (Jynx torquilla). The Eurasian wryneck (Jynx torquilla) is closely related to red-throated wryneck, or rufous-necked wryneck (Jynx ruficollis). The four recognized subspecies of the Eurasian wryneck are: Jynx torquilla torquilla Linnaeus, 1758, Jynx torquilla tschusii O. Kleinschmidt, 1907, Jynx torquilla mauretanica Rothschild, 1909 and Jynx torquilla himalayana Vaurie, 1959. Current topic in Birds of India: Eurasian wryneck - Jynx torquilla. The yellow-rumped honeyguide (Indicator xanthonotus) belongs to the family Indicatoridae under the order Piciformes. The family Indicatoridae contains seventeen species in four genera, viz., genus Indicator (eleven species), genus Melichneutes (one species), genus Melignomon (two species) and genus Prodotiscus (three species). Indicator is a genus of near passerine birds, having parrot-like zygodactyl feet. In zygodactyl arrangement of digits, two toes face forward (digits 2 and 3) and two back (digits 1 and 4). Zygodactyly has obvious advantages for birds that spend much of their time on tree trunks. The Indicator spp. are brood parasites, laying eggs in the nest of birds of other species and relying on the hosts to raise their young. The hosts being mostly hole-nesting species. The species Indicator xanthonotus was first described by Edward Blyth (23 December 1810 – 27 December 1873), an English zoologist. Image by (text) T C Jerdon; (art) R.E.B. Current topic in Birds of India: Yellow-rumped honeyguide (Indicator xanthonotus) images. The yellow-rumped honeyguide (Indicator xanthonotus) belongs to the family of honeyguides, Indicatoridae. The yellow-rumped honeyguide species are distributed in India, Pakistan, Nepal, Bhutan, Myanmar and China. These honeyguide species are brood parasites, laying eggs in the nest of other birds and rely on the host to raise their young. These honeyguides are polytypic species. The yellow-rumped honeyguide (Indicator xanthonotus) is a small headed, sparrow-sized bird, measuring 15 to 17 cm in length and weighing 25 to 35 grams. It is the only honeyguide in its range. The yellow-rumped honeyguide has dull olive-gray plumage. 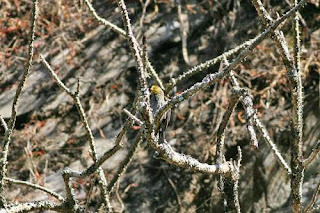 The male has bright yellowish orange forehead, crown, cheeks and rump. The orange coloration on the rump grades into sulfur yellow towards the back. The chin and throat are yellowish. The underparts are pale gray with dark streaking. There is a white stripe on the tertials. The female is duller and is less yellowish on the head and its rump coloration is yellowish. The bill of the yellow-rumped honeyguide is short, strong and finch-like. The bill is colored yellowish brown and is darker towards the tip. The irises are brown. The feet are grayish green. Two of the toes point backwards. The call of these honeyguides is probably a low “weet” sound. They apparently do not sing. 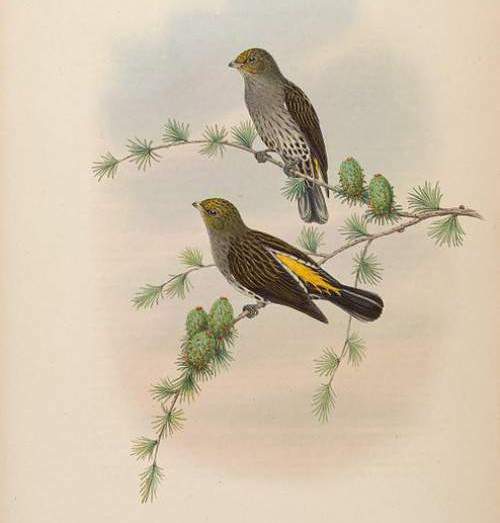 1.Birds of India - Image of Yellow-rumped honeyguide - Indicator xanthonotus by (text) T C Jerdon; (art) R.E.B. The yellow-rumped honeyguide species are distributed in montane forests along Himalayas in India, Pakistan, Nepal, Bhutan, north Myanmar and China (southeast Tibet). In India, these yellow-rumped honeyguide species are distributed in the states of Jammu and Kashmir, Uttarakhand, West Bengal, Sikkim, Arunachal Pradesh and Nagaland. 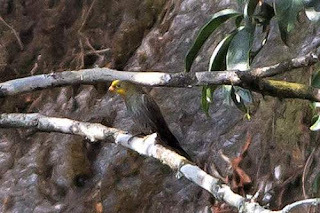 The yellow-rumped honeyguide nominate subspecies I. x. xanthonotus is distributed in Nepal, Bhutan, India (West Bengal, Sikkim, Arunachal Pradesh and Nagaland) north Myanmar and China (southeast Tibet). 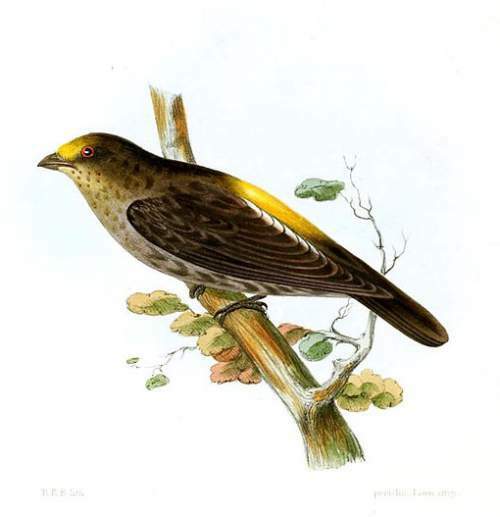 The yellow-rumped honeyguide subspecies I. x. radcliffii is distributed in northeast Pakistan (may be extinct) and northwest India (Jammu and Kashmir and Uttarakhand). The Important Bird and Biodiversity Areas (IBA) of these yellow-rumped honeyguide species in Nepal are, Makalu Barun National Park, Annapurna Conservation Area, Mai Valley forests and Langtang National Park. The Important Bird and Biodiversity Areas (IBA) of these honeyguide species in India is the Valley of Flowers National Park located in the Chamoli district of Uttarakhand state. These yellow-rumped honeyguide species have medium forest dependence. These species normally occur in altitudes from 600 to 3500 meters. 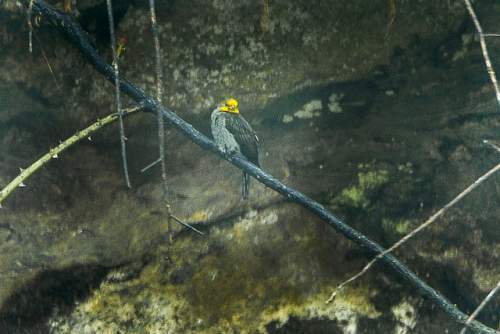 The natural ecosystems of these honeyguide species include areas having colonies of giant honeybee like rocky outcrops, cliffs and mountain peaks, broad-leaved forests, coniferous forests, tropical and subtropical moist forests, montane forests and wetlands and deciduous forests. The diet of the yellow-rumped honeyguide consists mainly of beeswax. Honeybee eggs, larvae and pupae, waxworms (caterpillar larvae of wax moths), beeswax, flying insects, bees and swarming termites are their primary food. Though there are records of honeyguides leading humans to the nests of wild bees, the yellow-rumped honeyguide has not been observed to lead humans or animals to bee hives. These yellow-rumped honeyguide species are brood parasites. They lay eggs in the nest of other species of birds and rely on the host to raise their young. The host species is unknown. Their breeding season is likely to coincide with that of the local host species. The breeding season of these yellow-rumped honeyguide species is from April to June in most of their range. The males are territorial, defending the area around giant honey bee (Apis dorsata) nests. The male yellow-rumped honeyguide is polygamous and allows only the females with whom it had mated and their young into its territory. The male courtship display involves holding the head and bill high, fluffing the feathers and flickering wings and rhythmically moving from side to side. The nestling of yellow-rumped honeyguides hatches earlier than the host's chicks. It evict the hosts's chicks from the nests. The chick has a membranous hook on the bill which it uses to puncture the host's eggs and to kill the host's young outright or by repeated wounds. The yellow-rumped honeyguide species are non-migratory resident birds. Altitudinal migration is observed in the birds residing in higher altitudes. These honeyguides move to lower levels and plains during winter. Post breeding, the juveniles may disperse and establish in new locations within the range. They may make local movements for feeding and breeding within their range. The global population size of the yellow-rumped honeyguide (Indicator xanthonotus) has not been quantified. The overall population trend of these species is reported to be decreasing. Throughout its range this species is reported to be very rare to uncommon. The generation length is 5.8 years. Its distribution size is about 1,030,000 sq.km. Habitat degradation, deforestation, over-exploitation of the giant bee nests for honey by humans and other activities affecting honeybee populations are the main threats that may endanger the survival of these honeyguide species. The yellow-rumped honeyguide (Indicator xanthonotus) is approaching the thresholds for being Vulnerable, under the range size criterion, under the population trend criterion and under the population size criterion. The IUCN (International Union for Conservation of Nature) has categorized and evaluated the species and has listed it as "Near Threatened". The CITES (Convention on International Trade in Endangered Species of Wild Fauna and Flora) status is ‘Not Evaluated’ for yellow-rumped honeyguide (Indicator xanthonotus). The yellow-rumped honeyguide (Indicator xanthonotus) is closely related to Malaysian honeyguide (Indicator archipelagicus) and greater honeyguide (Indicator indicator). The two recognized subspecies of yellow-rumped honeyguide are: Indicator xanthonotus radcliffii A. O. Hume, 1870 and Indicator xanthonotus xanthonotus Blyth, 1842. Current topic in Birds of India: Yellow-rumped honeyguide - Indicator xanthonotus. The great barbet (Psilopogon virens) belongs to the family Megalaimidae under the order Piciformes. The family Megalaimidae is divided into subfamilies Megalaiminae and Caloramphinae. The subfamily Megalaiminae is monotypic, having a single genus, Psilopogon, under it. The subfamily Caloramphinae is also monotypic, having a single genus, Caloramphus under it. Earlier the genus Psilopogon had a single species, Psilopogon pyrolophus included in it. But, the molecular phylogenetic studies found the genus Psilopogon to be nested within an evolutionary branch consisting of species placed in the genus Megalaima. The genus Megalaima was erected by George Robert Gray FRS (8 July 1808 – 6 May 1872), an English zoologist, in 1841. The genus Psilopogon was described by Dr. Salomon Müller (April 7, 1804 – December 29, 1864), a German naturalist, in the year 1835-36. Hence, the genus name Psilopogon takes priority over the name 'Megalaima'. The genus Psilopogon has 32 species placed under it, with Psilopogon pyrolophus as type species. 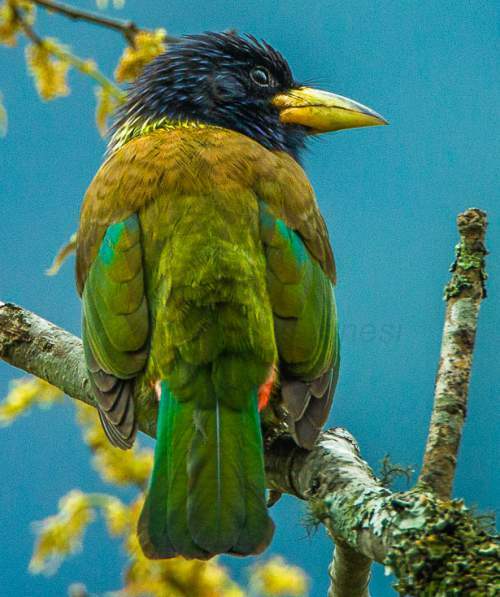 Current topic in Birds of India: Great barbet (Psilopogon virens) photos. The great barbet (Psilopogon virens) belongs to the family of Asian barbets, Megalaimidae. The great barbet species are distributed in India, Pakistan, Nepal, Bhutan, Bangladesh, Myanmar, Thailand, China, Laos and Vietnam. These barbet species have heavy bills fringed with bristles. These barbets are polytypic species. The great barbet (Psilopogon virens) is the largest barbet, measuring 30 to 35 cm in length and weighing 160 to 300 grams. Both the sexes appear similar. The great barbet has dark bluish black head with large yellowish ivory bill. It has short neck and tail. The nape, sides of the neck and the throat are also bluish black. These birds have black bristles at the base of the nostrils, in front of the lores and on anterior chin. The upper back of the barbet is deep brown to chestnut brown with pale, yellow, thin and short streaking. The mid-back is yellowish brown or brown. The lower back is green. The rump and the upper tail-coverts are green with pale yellowish green tips. The breast is dark brown near throat and pale brown towards the mid-breast. The lower breast is pale blue. The belly has pale streaks. The sides and flanks are streaked. The outer thighs are green. The tail feathers of the barbet are green with narrow dull brown tips. The feather shafts are brownish black or brown. The undertail is yellowish green with blue sheen. The extreme margins of feathers are darker. The undertail coverts are red. The bill is yellowish ivory. It is long, broad, curved along the culmen. The base of the bill is yellowish orange. The upper mandible has bluish black patch near the tip. The bill is ivory towards the tip. The irises are dark brown and the orbital skin is black. The legs and feets are grayish or yellowish green. The plumage of females and immature birds is duller. There is considerable plumage variation between the great barbet subspecies. 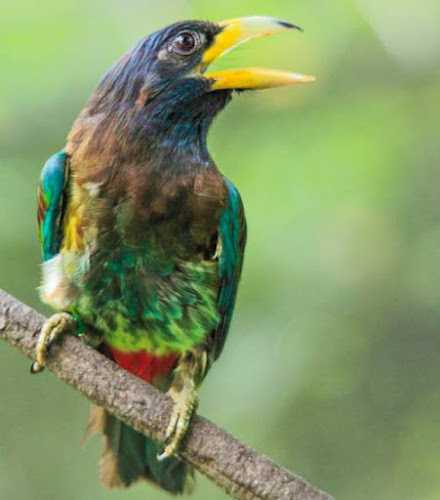 The call of these barbets is a loud "kay-ob" or a continuous "piou-piou-piou-piou" or a grating "keeab" sound. The bill is closed while singing and there is great outward expansion of the throat with each note. The great barbet species are distributed in India, Pakistan, Nepal, Bhutan, Bangladesh, Myanmar, Thailand, China, Laos and Vietnam. 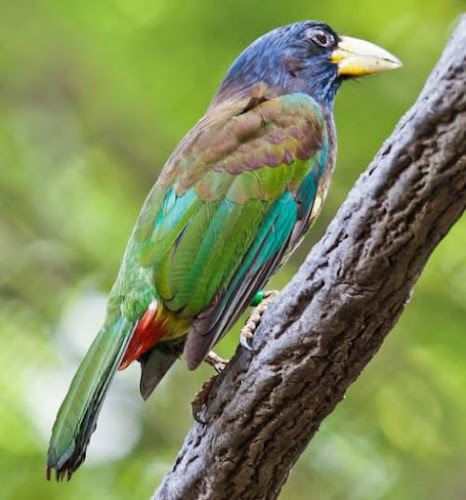 In India, these great barbet species are distributed in the states of Jammu and Kashmir, Himachal Pradesh, Punjab, Haryana, Uttarakhand, West Bengal, Sikkim, Assam, Meghalaya, Arunachal Pradesh, Nagaland, Manipur, Mizoram and Tripura. 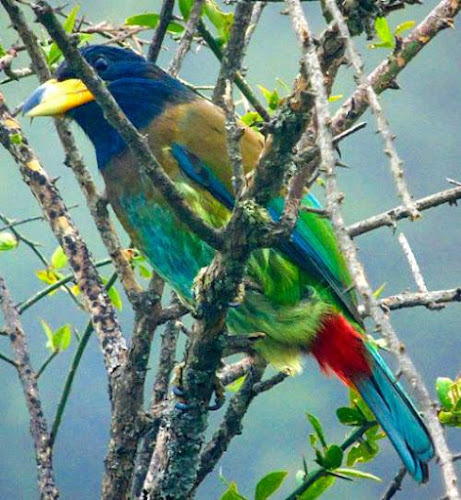 In China, these great barbet species are distributed in the provinces of Yunnan, Sichuan, Guizhou, Guangxi, Hunan, Guangdong, Fujian, Jiangxi, Anhui, Zhejiang and Jiangsu. The great barbet nominate subspecies P. v. virens is distributed in central Myanmar, north and central Thailand, north Laos, north Vietnam and southcentral and southeast China. 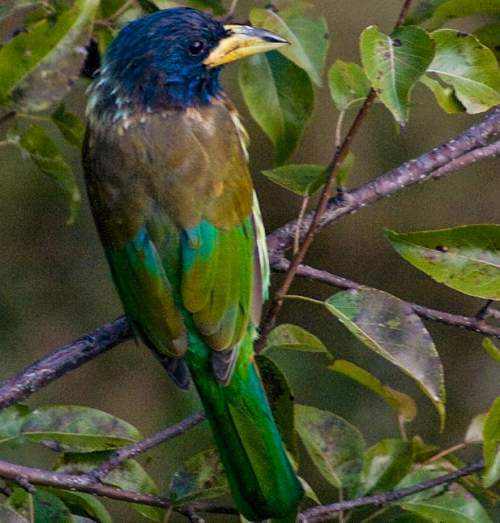 The great barbet subspecies P. v. marshallorum is distributed in northeast Pakistan, northwest and north India along the Himalayas and Nepal. The subspecies P. v. magnificus is distributed in east Nepal and west and central Assam(India). 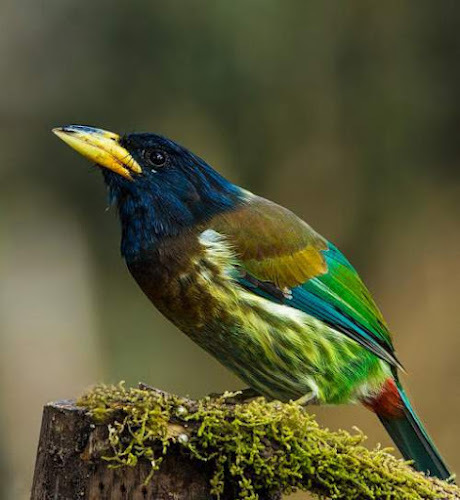 The great barbet subspecies P. v. clamator is distributed in northeast India (northeast Assam, Arunachal Pradesh, Nagaland, Meghalaya, Tripura, Mizoram), north Myanmar, Northwest Thailand and south central China (west Yunnan). These great barbet species have high forest dependence. These species normally occur in altitudes from 0 to 3000 meters. The artificial ecosystems of these species include orchards, plantations and rural gardens. The natural ecosystems of these great barbet species include temperate forests, broad-leaved evergreen forests, deciduous forests, tropical and subtropical moist lowland forests and tropical and subtropical moist montane forests. The diet of the great barbet consists mainly of wild fruits. Figs, berries, wild plums, flowers, buds and seeds are their primary food. Occasionally they may take insects. The breeding season of these great barbet species is from February to September in most of their range. Sometimes two or three broods are raised in a season. Their nesting sites include tree cavities, tree holes and abandoned nesting holes of other birds. No nesting material is used. The typical great barbet clutch contains 2-4 eggs. The chicks hatch out in about 15 days. The great barbet species are non-migratory resident birds. Altitudinal migration is observed in the birds residing in higher altitudes. These barbets move to lower levels and plains during winter. Post breeding, the juveniles may disperse and establish in new locations within the range. They may make local movements for feeding and breeding within their range. The global population size of the great barbet (Psilopogon virens) has not been quantified. The overall population trend of these species is reported to be stable. Throughout its range this species is reported to be common and is locally very common in Pakistan. The generation length is 8.5 years. Its distribution size is about 6,680,000 sq.km. Habitat degradation, habitat fragmentation, deforestation and hunting are the main threats that may endanger the survival of these barbet species. The great barbet (Psilopogon virens) does not approach the thresholds for being Vulnerable, either under the range size criterion, or under the population trend criterion or under the population size criterion. The IUCN (International Union for Conservation of Nature) has categorized and evaluated the barbet species and has listed it as of "Least Concern". The CITES (Convention on International Trade in Endangered Species of Wild Fauna and Flora) status is ‘Not Evaluated’ for great barbet (Psilopogon virens). The great barbet (Psilopogon virens) is closely related to the red-vented barbet (Psilopogon lagrandieri). The four recognized subspecies of the great barbet are: Psilopogon virens virens (Boddaert, 1783), Psilopogon virens clamator (Mayr, 1941), Psilopogon virens magnificus (E. C. S. Baker, 1926) and Psilopogon virens marshallorum (Swinhoe, 1870). 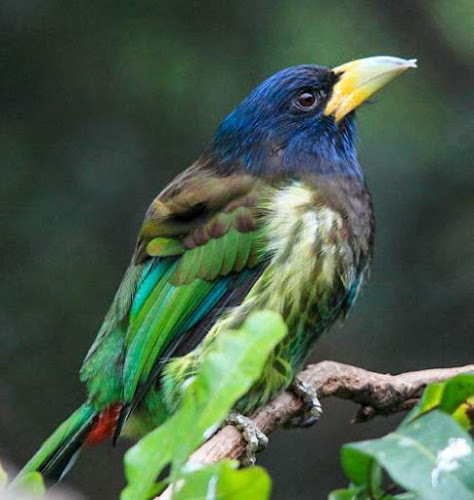 Current topic in Birds of India: Great barbet - Psilopogon virens.